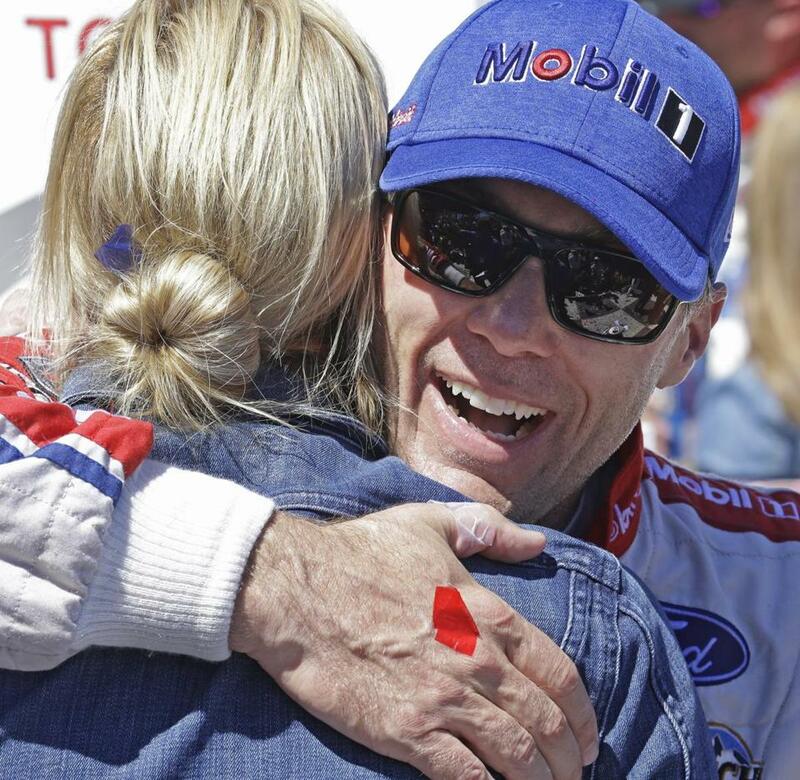 Kevin Harvick embraces his wife DeLana after winning the NASCAR Sprint Cup race Sunday in Sonoma, Calif.
SONONA, Calif. — Kevin Harvick returned to Victory Lane for the first time this season with a dominating run Sunday in the Toyota/Save Mart 350 on the road course at Sonoma Raceway. The former NASCAR champion came to Sonoma winless in 20 races since Kansas last fall and has been overshadowed in this season of NASCAR’s young new superstars. But at a track where experience and ability can separate the field, it was Harvick and a bunch of veterans who led the way. It was the first win on the winding wine country road course in 17 tries for the Bakersfield, Calif., driver. Sonoma was one of just four active tracks where Harvick had never before scored a Cup victory. ‘‘To finally check this one off the list . . . being so close to home and having raced here so much, this was one that was on the top of the list,’’ Harvick said. Harvick was on cruise control and conserving fuel in the race that ended under caution after Kasey Kahne had a hard accident on the final lap. Either way, Harvick had a cozy nine-second lead over Stewart-Haas Racing teammate Clint Bowyer before the caution. Bowyer, now the driver for the entry Tony Stewart used for his final NASCAR victory last year at the track, was second and Brad Keselowski third as Ford cars went 1-2-3. For Harvick, it was the first victory since Stewart-Haas Racing switched to Ford this season. Harvick had spent 16 years in a Chevrolet. It was Ford’s seventh victory of the season. Ford won eight Cup races last season, and seven came exclusively from Team Penske drivers. This year, the manufacturer has wins from Penske, Roush-Fenway Racing, The Wood Brothers and SHR. ‘‘Getting our first win with Ford, this has been a great journey for us as an organization and team,’’ Harvick said. Martin Truex Jr. led 25 laps but suffered an engine failure and finished 37th. Truex won the first stage of the race, his series-leading 11th stage victory. Jimmie Johnson won the second stage, his first stage victory of the season, but finished 13th overall. Kyle Larson and Jamie McMurray started on the pole for Chip Ganassi Racing and hoped to give the owner a sweep of Sunday after Scott Dixon won the IndyCar race at Road America in Wisconsin. But Larson, the points leader, was never a factor and finished 26th. McMurray was 10th. Kahne was in a hard accident on the final lap of the race and had harsh words for Kevin O'Connell, who was making his Cup debut. He couldn’t catch teammate Harvick for the win, but Bowyer still finished a season-best second. He was content with that and knows how hard his new SHR team is working. He also understood that Harvick was eventually going to get a win. ‘‘Let’s face it, you’re not going to keep that team that’s won a championship, won all these races in the last five years, you’re not going to keep them out of winning,’’ Bowyer said. Day won the NASCAR Whelen Euro race in England on June 11 at Brands Hatch. He was planning to return to Israel after that race, then got the call to race at Sonoma.